Canon BU-47H High Definition PTZ Cameras - Fiber Group Inc.
Canon introduces the versatile BU-47H, the latest turn-key Pan-Tilt-Zoom camera solution for outdoor broadcasters, cable networks, diverse businesses, weather monitoring and traffic POV. The BU-47H features several new technologies and standard functions in a compact, weatherproof body, all the while ensuring high image quality in production, making it Canon’s most capable outdoor PTZ camera. The BU-47H houses a three CMOS sensor and DIGIC DV III Image Processor combination, outputting 1080i Full HD resolution with a full array of video adjustment options, including color level, gain, gamma, white balance, skin detail, and sharpness. Canon CMOS sensors offer several advantages over traditional CCD: reduced power consumption, exceptional low-light performance, and resistance to glare. The use of multiple CMOS sensors dedicated to separate RGB channels improves noise and color accuracy. The BU-47H is prepared for a wide range of lighting conditions with a minimum required brightness of 0.08 lux (under 60i, +33dB and shutter 1/4 conditions) and four ND filter positions (Off, 1/4, 1/16 and 1/64) for brightly lit scenes. 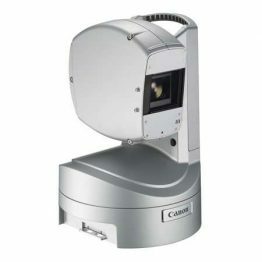 The 18x Wide-Angle zoom lens utilizes multiple aspherical and Hi-UD elements for distortion-free images and optical image stabilization for clear images in high-vibration environments. The BU-47H includes a wiper for the lens and is IP45 rated dust- and waterproof, able to withstand a direct water jet and particulate matter to 1mm. Its compact size is unobtrusive for versatile placement and installation, while its minimal weight does not require a heavy-duty mount. *Some functions may be limited depending on operating environment.